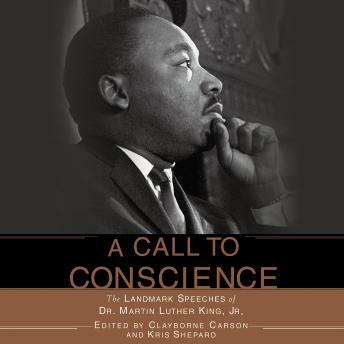 Listen to "A Call to Conscience: The Landmark Speeches of Dr. Martin Luther King, Jr." on your iOS and Android device. His speeches stirred a generation to change - and outlined a practical way to economic freedom and true democracy. His words would help bring about the end of a brutally unequal system - and would show a timeless method for achieving fairness and justice for all.These 12 moving speeches voiced by Dr. Martin Luther King, Jr. are original recordings collected here for the first time ever. In addition, some of the world's most renowned leaders and theologians share with you their reflections on these speeches, and give priceless firsthand testimony on the events that inspired their delivery.This audio takes you behind the scenes on an astonishing spoken historical journey - from a small, crowded church in Montgomery, AL, where "The Birth of a New Nation" ignited the modern civil rights movement; to the center of the nation's conscience; to the Mason Temple in Memphis, where more than 10,000 people heard Dr. King give his last transcendent speech, "I've Been to the Mountaintop", the night before his assassination.Narrators include Andrew Young, Coretta Scott King, Reverend Leon H. Sullivan, Hon. Walter E. Fauntroy, Yolanda King, Dr. Dorothy I. Height, Rev. Fred Shuttlesworth, Martin Luther King III, Rep. John Lewis, Ambassador George McGovern, and Sen. Edward M. Kennedy. One of the best selections I've heard. I have recommended it to strangers, friends and family. Rarely would I suggest someone purchase the audiobook version of any book, over the printed version. There is always something lost when you aren't actually "reading" the text. This is one case where I highly suggest the opposite. As a child/teen, MLK Jr. was one of my few heros. Listening to him speak was an incredibly moving experience for me - allowing me to almost touch/feel one whom I had admired so much, for so long. His prophetic words apply today, as much as they did then. Do not get discouraged by the poor audio quality of the first speech though. All others in this volume are quite good, especially considering their age. This is one book which I plan to buy, to keep on my shelf fur further inspiration. For anyone who ever wanted to know the personality behind Dr. Martin Luther King, this is the book! The recording in his voice, with his great oracle tone and the spirit of the man that spoke to the spirit of the people...anyone who wants to know what it was like to sit among the congregation and hear Dr. King speak...this is the book! Dr. King's power, insight and even levity are beyond the ability of this reader/listener to expound upon. A must for all who have an interest in the righteous causes not only of yesterday but today and tomorrow as well. Compelling. We need a Dr. King today. This is an incredible audio book, and should be required listening for all. Just reading this book would not do it justice. I feel privileged to be able to hear the words and voice of Martin Luther King nearly 40 years after his death. There is one speech that is hard to hear - the first one - but the rest are easily understood. On occasion, I found myself nearly moved to tears by his emotional words of strength, commitment, brotherhood and love which demonstrated his god gifted abilitiy to lead us through the worst times of racism and ignorance. Martin Luther King did not merely represent the black person; he represented all people oppressed by their society and struggling for freedom and a better life. I now know much more than I ever did before, that he was a great man with great skills, and that it was a great loss for america and the world when he was assassinated on that fateful day in April 1968. These are live recordings of Dr. King so the quality isn't great, which is a little irritating at first, but you get swept up in his words! It's amazing to hear him actually speaking these things that changed so many American lives. I highly recommend listening, even though the selection I rented had two or three disc that just wouldn't play for some reason, so you might only get half the speeches.